Coffee Lover’s rejoice! 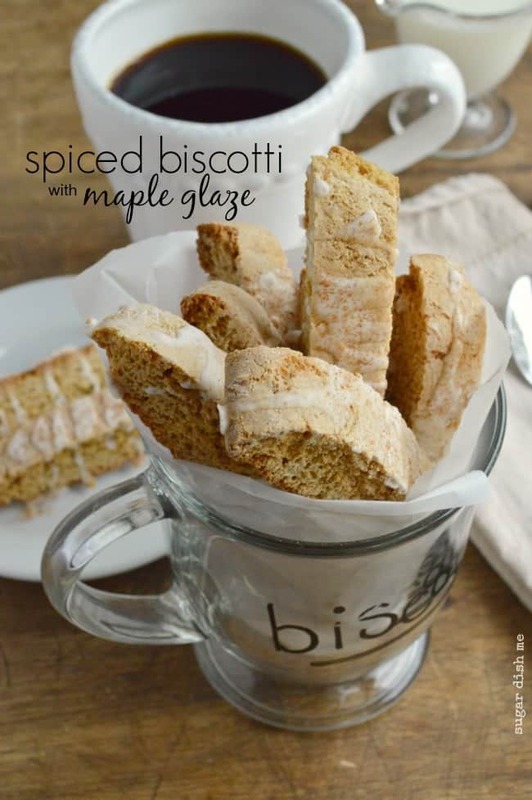 This easy recipe for Spiced Biscotti with Maple Glaze is the perfect companion for your morning cup of joe. Makes a great gift! Coffee Loving me made you coffee-dunking cookies. I have been hoarding this Spiced Biscotti with Maple Glaze for weeks. It is my new favorite little morning indulgence while I park at my desk and bang out some work. 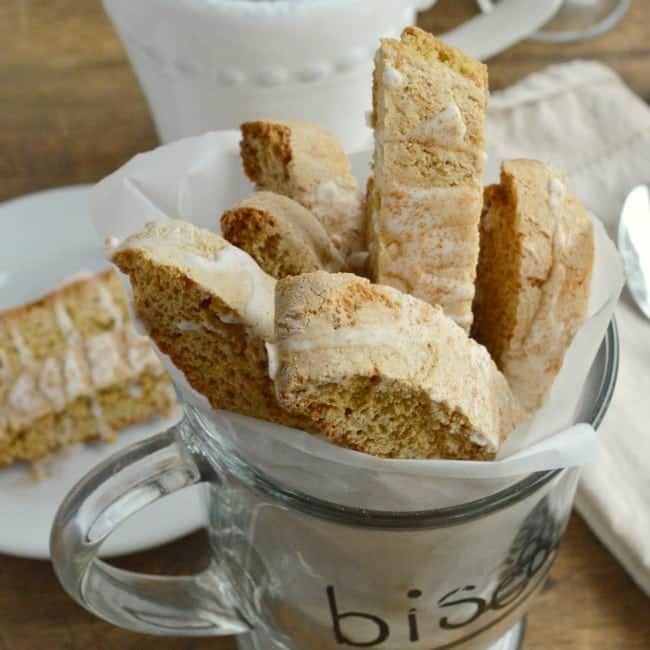 Biscotti is perfect for gifting. I love it as a hostess gift, and it wraps up pretty. Plus! It keeps for forever. 30 day in an airtight container — that’s 30 days of a HAPPY cup of coffee. Because biscotti isn’t a soft cookie it also ships really well. 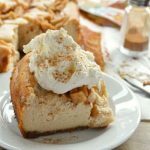 If you need tips on cookie mailing this holiday season, you definitely need to check out this post I wrote on How to Ship Baked Goods. It is a really great resource and there are also some really super reader tips in the comments. You probably have everything you need to make Spiced Biscotti with Maple Glaze hanging out in your pantry. 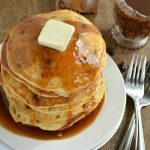 There’s no butter necessary! 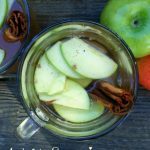 The spice is that blend we all adore — the one that makes things like pumpkin spice so delicious and appealing. Cloves, cinnamon, and ginger give this biscotti just the right amount of spice. 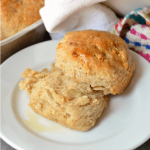 The fragrance is perfect and the cookie texture will soak your coffee right up. Last year I made these itty bitty Gingerbread Biscotti. They also make great gifts! And they have an orange glaze. 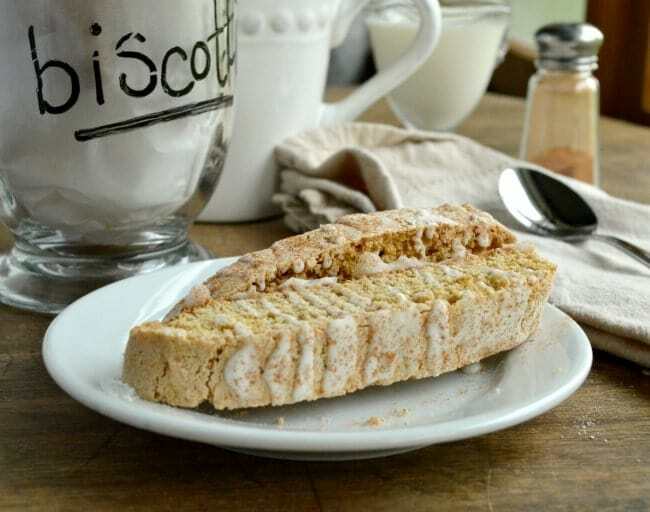 Do you have a favorite biscotti flavor? I am feeling the need to make a zillion more cookies for my coffee.